DID YOU KNOW THAT YOUR PHYSICAL WORKPLACE CAN HELP YOU MORE EFFECTIVELY IMPLEMENT YOUR STRATEGY, BUILD YOUR BRAND, AND SUPPORT YOUR CULTURE? Forward Space exists to help you propel your organization forward and bring to life the space and environments that are precisely designed for your purpose. We help our customers to create innovative work environments that inspire people to excel wherever and however they work. When you propel your organization forward with us, you’ll always find a distinct point of view, depth of resources and inventive solutions. 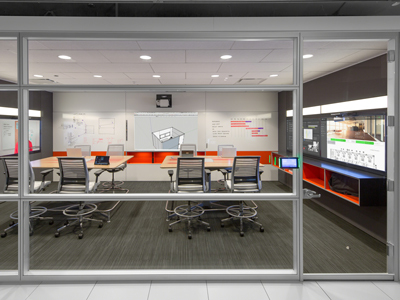 Armed with intelligent design and research from Steelcase, our Forward Space teams are equipped with the expertise and perspective to help you realize a dynamic environment where people and ideas flow without restraint. Following this approach, we’ve helped leading corporations break down old walls, and vibrant entrepreneurs build new spaces to fuel their future. We understand there’s only one direction that matters and that’s Forward. We’re here to guide you there. Forward Space is proud to be a woman-owned business certified by the Women’s Business Enterprise National Council (WBENC) – the largest third-party certifier of businesses owned, controlled, and operated by women in the United States – and a member of the National Association of Women Business Owners (NAWBO) – an organization representing over 5000 members and 60 chapters across the country. Our President/CEO, Jenny Niemann has over 22 years of experience in senior management and leadership positions in the industry focusing on innovation, sales strategies and process improvement. She has experience building strong client relationships and is also committed to the industry and community through CoreNet, Young Presidents Organization (YPO) and through support for United Way. Click here to view Jenny’s bio. At Forward Space, we not only focus on the physical workspace, we explore how it relates to employee productivity, creativity, collaboration, and wellbeing. Our solutions are scalable to help you adapt to changes in technology, business processes and today’s work force. Through the integration of the workplace’s four basic elements—furniture, architecture, technology, and flooring—we’ll create an environment that’s tailored to the way you do business. 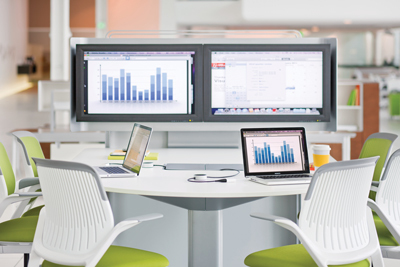 While we are proud to be an authorized Steelcase dealer, we also offer access to hundreds of other product lines and manufacturers that cover a broad range of applications, price points, and finish selections. In fact, we’re experts in specifying and installing these products. We’ll get you what you need, and get it installed correctly – down to the last nut and bolt. We’ll start by helping you define your needs and cutting the options down to size. 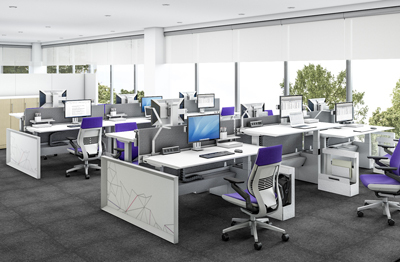 Architectural products integrate architecture, furniture and technology for a more effective workplace. They include moveable walls, access floors, modular power and cabling, and acoustic solutions. They provide more options to define environments, increased flexibility and additional design elements. They can be a superior alternative to traditional construction that’s simpler to build, easier to change, more environmentally responsible, and much more cost-effective. Our customized solutions can increase productivity and collaboration for corporations, educational institutions, healthcare organizations and government agencies. From meeting rooms and teaming spaces to training centers and classrooms, we work closely with you to create solutions that support your business needs. Our professional staff will ensure a fully functional, high-performance environment through our ability to seamlessly meld technology with furniture and architectural systems. Floor covering is generally one of the components signaling the finalization of a new construction or renovation project, and it requires expertise in a variety of disciplines and materials. We bring direct knowledge, technical capabilities, and effective management to every project – local or national. 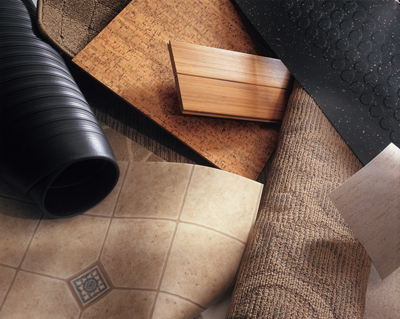 Our flooring experts will recommend the appropriate material and performance specifications for every situation. In addition, we can often provide dramatic cost savings in renovation projects where systems furniture can be left in place and intact during the process of replacing your carpet. 1/3 of workers in 17 of the world’s most important economies are disengaged, according to new research from Steelcase. Working with global research firm Ipsos, the Steelcase Global Report is the first to explore the relationship between engagement and the workplace. Monday through Friday (8am – 5pm).